The “George Comes to Benton – 1963” mural is an one-of-a-kind piece of art created by California artist John Cerney. Beatles fans from across the country who traveled Interstate 57 through southern Illinois on their way to and from the total solar eclipse of 2017 had a chance to see the original work the week of its construction. 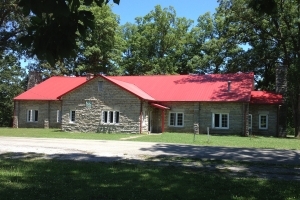 Now a tourism site, Cerney and the City of Benton, published a postcard of the picturesque attraction which gives a brief description of how the project unfolded. 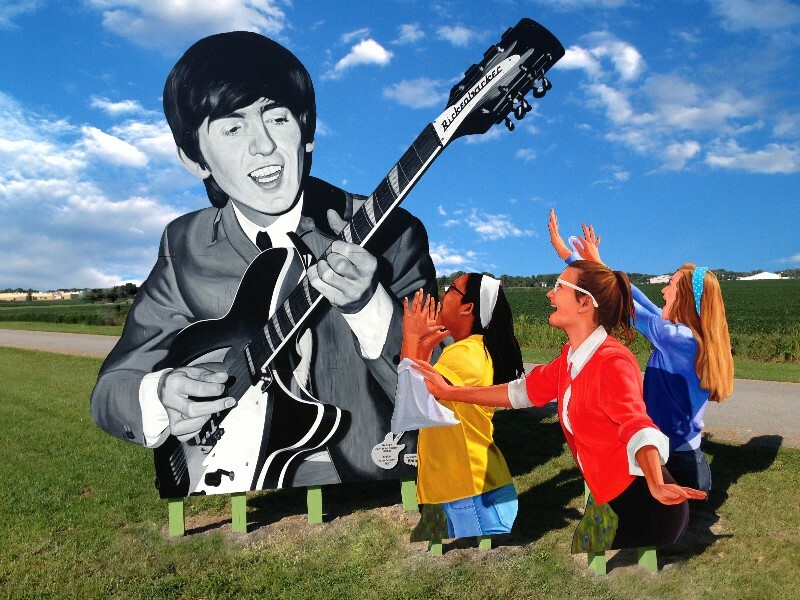 “George Comes to Benton- 1963” – This mural installation, painted in 2017, commemorates the first visit by a Beatle to America. Several months ahead of the British rock group’s big splash on US soil in early 1964, George Harrison and his brother Peter came to Benton, Illinois to visit their sister Louise and her family. The Beatles were unknown to Americans, despite being at the top of the charts in England, and George was able to remain anonymous during his two week stay. He played with a local band, bought a guitar in a neighboring town, and mostly hung out as a tourist. The Beatles were about to explode on the world stage, and for years to come, folks in Southern Illinois would recall the police young man with long hair and a funny accent. Created by California artist John Cerney, the 16-foot-tall mural is located along Interstate 57 in Benton, Illinois. The artist was inspired by the retelling of the ‘George Harrison in Benton’ story by DJ Phlash Phelps on his ‘60’s on 6’ Sirius XM Radio show. Much appreciation and support to the City of Benton, in particular Rachel Gartner and Brook Craig, as well as the mayor and the Benton City Council. Mural installation help provided by the Benton City Street Department (Scott Skinner and Danial Webb). Models for George’s adoring fans are Alicia Tongol, Kiyah Hoffman, and Cassidy Hebert, photographed by Victor Lurz. Thanks as well to Holly Hebert for her assistance. The mural is dedicated to George and Louise Harrison. Mural photo by John Cerney, and photo editing by Carol Catalano. The City of Benton is very grateful to Cerney (www.johncerneymurals.com) for the donation of his approximately $20,000 mural. You can take home your own mural memorabilia by stopping by one of several stores in town, the Chamber of Commerce found in the Franklin County Ford Garage Museum, Benton City Hall or the historic Jail Museum to pick up a free oversized postcard. While the mural is a little off the beaten path, the directions shown in the map pictured here will take you from Route 14 to the mural, found on Airport Road. 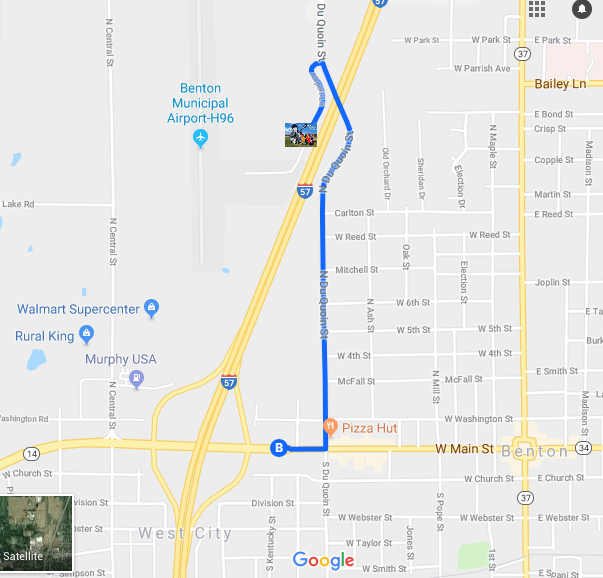 If you’re coming through Benton, we encourage you to make a stop by the mural, pose for a picture with the one-of-a-kind piece of art, then take a drive around our town to check out the other unique stores and eateries we have to offer.